Darren Aronofsky is one of this generation’s most interesting contemporary directors, one whose most outrageous and daring projects are interesting even when they don’t entirely succeed. Starting with Pi in 1998 he made a name for himself, following that up with the best film of the past 10 years, Requiem for a Dream [writeup here]. It took six more years for The Fountain to see the light of day, thanks to a variety of production issues, but only two years after that he gave the world The Wrestler, itself a fantastic movie. 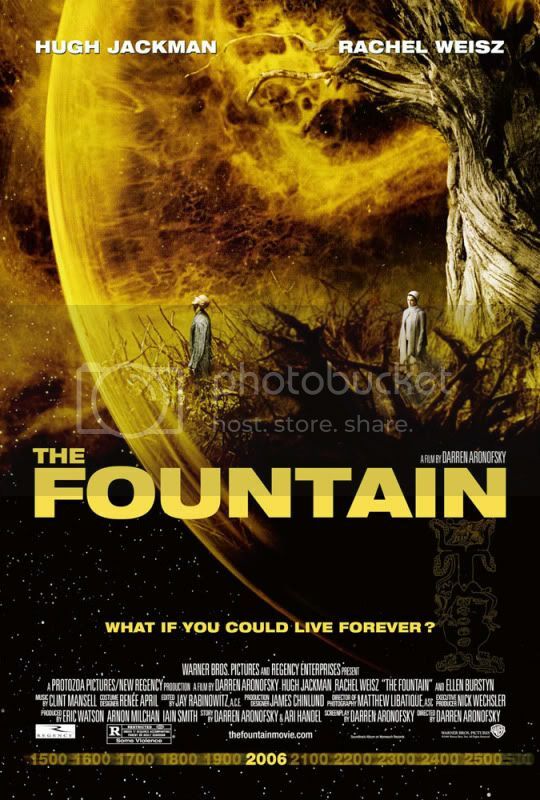 The Fountain is not Aronofsky’s best-received film, with some saying that it was a failure, but an interesting one. I don’t believe it is a failure at all, just a film with more outstanding flaws than one might expect from Aronofsky. Some may say it’s pretentious and hollow, and this criticism, while more to the point, is also not entirely accurate. The story is fairly straightforward, though a first time viewer may have trouble putting it all together until it’s over. The foremost tale is about Tommy (Hugh Jackman), a scientist researching cures for brain tumors. It just so happens that his wife, Izzy (Rachel Weisz), is slowly dying from a tumor. It may appear to be a conflict of interest, but Tommy is madly obsessed with finding a cure before she succumbs to the malady. Izzy is an author, working on a book about Spain during the Inquisition. Her story follows Tomas (Jackman) as he does as the Queen’s (Weisz) bidding and travels to South America to find the Tree of Life, said to contain magical properties that will save her from the Grand Inquisitor (Stephen McHattie). The third thread is intimately connected to the first two, in ways that are not revealed until the end of the film. This final thread is the most beautiful and obtuse, and the most striking because of it. It concerns the travels of a space man (Jackman) as he maneuvers his bubble toward a distant star. In the bubble is a dying tree, one that seems to give the space man life and sustenance. The reasons for the journey are unclear at first, but tie in rather nicely with the other two parts as the film comes together in the last third. Pretension is a bit hard to qualify or quantify, and, without looking at a dictionary definition, would seem best described as something that thinks itself more important than it actually is. Such a quality is decidedly subjective, as various objects or people will appear different to different observers. Perhaps this is why I don’t believe The Fountain to be overly pretentious. The themes it presents are universal and intimate, and the relationship between Tommy and Izzy (the central connection of the film) is believable and moving. The way the film presents these themes is sometimes a bit extravagant and ostentatious, and because of this the film may be a tad pretentious. But the images are so beautiful and the score so powerful that I am wont to forgive these flaws and become enveloped in the film. Aronofsky’s aesthetic is impeccable, and the special effects created by photographing chemical reactions in a petri dish are powerful and unique. The jungles of South America are very dark, but also lush and detailed. The space-faring episode is certainly the most intense and beautiful. 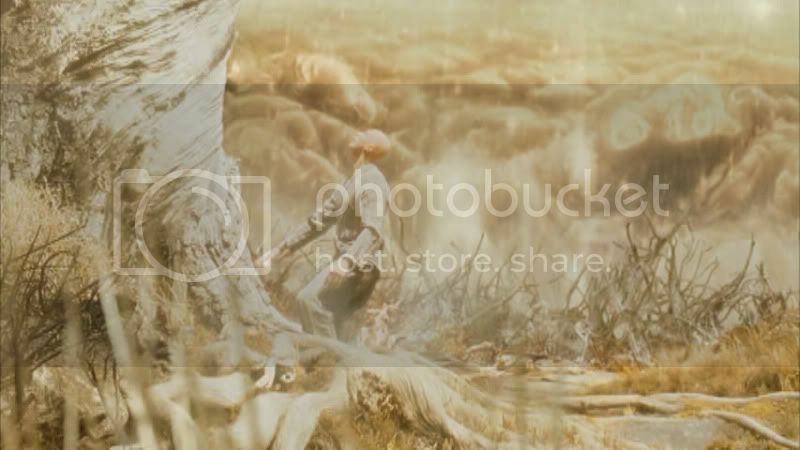 Aronofsky’s touch for repetition is reexamined in The Fountain, as numerous shots and angles are used a number of times throughout the film. Rather than seem showy these help craft a common thread between the three primary stories. The movie has its setbacks, unfortunately, outside of the slight air of pretension. Some of the acting is less than superb, with Weisz and Ellen Burstyn (as Tommy’s supervisor) seeming like cursory characters at times. The fault for this must lie at least partially with Aronofsky, who knew the kind of talent he was coordinating (Burstyn was nominated for an Oscar for her work in Requiem for a Dream). Because of this certain scenes in the normal world of Tommy and Izzy are not as convincing as they might be otherwise. For all its flaws, The Fountain moves me deeply and is a thoroughly interesting film. The visuals are mindblowing at times, and almost lazy at others, but when the film hits its stride, visually, the results are fantastic. Tommy and Izzy’s relationship, while not consistently convincing due to some script and acting problems, is authentic and honest, and therefore moving. The film would not be as powerful as it is without the soundtrack by Clint Mansell. Some might argue that a film should be able to stand on its own, regardless of its soundtrack. I would retort that film, since the late 1920’s, has been an auditory experience as well as an ocular one, and the director is cognizant of what sounds he or she pairs with what images. This pairing is what makes a powerful experience, as evidenced by Requiem for a Dream and Aronofsky’s other efforts. Even when he’s not at his peak his work is interesting, and The Fountain, while not a masterpiece, is interesting because its highlights shine brightly even through its flaws. This entry was posted in 3 pirate flags, 3.5 stars, F, Movie Reviews, Pirate Flag Rating, Star Rating on July 19, 2010 by Tim Irwin.